There is a simple way to allow troubled homeowners to stay in their homes without also bailing out the mortgage issuers and speculators. Congress can pass legislation granting current homeowners the right to stay in their homes as long as they like, simply by paying the fair-market rent. In other words, no one gets tossed out on the street, as long as they can pay the rental value of their house. The fair rent would be determined by an independent appraiser. Among the policy interventions I have heard floated in the current environment, this is one of the better ones. Update: For a truly terrible idea, click here. Also, here is Arnold Kling's proposal for a new agency to fix the problem, wonderfully named Bailie Mae. Ian emails me to ask for more suggestions. If you know of any similar prediction tools, post them in the comments section. You can also read the first chapter of Ian's new book Supercrunchers. This paper uses Social Security Administration longitudinal earnings micro data since 1937 to analyze the evolution of inequality and mobility in the United States. Earnings inequality follows a U-shape pattern, decreasing sharply up to 1953 and increasing steadily afterwards. We find that short-term and long-term (rank based) mobility among all workers has been quite stable since 1950 (after a temporary surge during World War II). Here is a free link to the paper. For those readers who are now, or will soon be, starting college, here are some words of wisdom from Conan O'Brien. In this op-ed, Gregory Clark, author of the widely talked about book A Farewell to Alms, discusses "How to Save Africa." Charles River Country Club in Newton -- with its rolling fairways and carefully manicured putting greens -- received a $381,000 tax break last year under a state law that exempts private country clubs from paying 75 percent of their property taxes. Amazon's list of the most popular items in economics puts The Communist Manifesto well ahead of The Wealth of Nations and Capitalism and Freedom. I was not following politics closely while vacationing on Nantucket. So, to catch up on developments upon my return, I did what comes naturally to an economist: I checked market prices. According to intrade, the probability that Hillary Clinton will be the Democratic nominee is now better than two out of three. The last 5-10% of this move might be attributed to Intrade changing margin requirements on August 13th, which forced some large short Clinton /long Obama traders, already suffering losses, to liquidate. After the margin change, over-margined traders were extended a grace period of approximately one week, and from the 20th-22nd you can see the Obama contract drop sharply from 22 to a low of 15 on heavy volume and no real news. 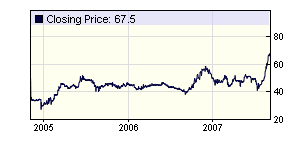 Given this, I think Obama is a buy here for a bounce back into the 20s. I think Brad somewhat overstates how much things have changed. The average salary for full professors at private, doctoral universities is now $136,689. (Source.) To compute total compensation, you should include the value of employer-provided health insurance, contributions to retirement accounts, and other fringes. You might then get to around $160,000. (I am guessing that the 1905 prof did not get these fringes; there was no income tax to avoid.) I don't know what modern data are comparable to the Lebergott data, but average hourly earnings are now about $17, suggesting annual earnings about $34,000 for a full-time worker, with compensation (including fringes) a bit higher than that. The relative price of professors still seems to be about four. Update: The comments raise a couple of fair points. First, with a more comprehensive group of professors, the average compensation would be lower, and the relative price today might be closer to three than four. Still, a professor need not be an "academic celebrity" to make four times as much as the average worker: Being a typical full professor at a private, doctoral university will do. Second, with the average American more educated today than a century ago, one would expect this relative price to have fallen, as it may have done to some extent. US News ranks Harvard as the second best national university, after my alma mater Princeton. Looking at the new rankings reminded me of a conversation I had with a teacher at a mid-ranked university a few years. He told me that all classes of introductory econ at his school were, without exception, capped at 49 students. Why such an odd number?, I asked. He explained that the US News ranking penalizes schools based on the percentage of classes with 50 or more students. Deans, like all people, respond to incentives. I recently read Nineteen Minutes by Jodi Picoult. A friend called the novel to my attention because, on page 449, my favorite economics textbook makes a brief appearance. One of the characters, an economics professor, assigns the text in his introductory microeconomics course at the fictional Sterling College. Reaching for some chalk, Lewis began to print across the board, a long and lovely stream of numbers that calmed him inside. She seems to think we are even nerdier than we are. Here is a new podcast of Paul Romer talking about long-run economic growth. For my academic colleagues obsessed with using Google-Scholar to count citations to their own and others' work (I won't mention names), I recommend downloading the free software Publish or Perish. I am among the many with serious doubts about the wisdom of the government quasi-guarantees that supported the government-sponsored entities, Fannie Mae, and Freddie Mac. But surely if there is ever a moment when they should expand their activities it is now. This reminds me of Saint Augustine: "Oh Lord, give me chastity, but do not give it yet." Bruce Bartlett disses the Fair Tax. Studies in cognitive and social psychology have identified deep causes for the overoptimism, wishful thinking, herd behavior, short memory, complacency, and naive extrapolation that generate speculative bubbles--and that require heavy doses of reality to hold in check. Any efforts to soften the blow will set the stage for future bubbles. A new Cato Institute publication says "state and federal gasoline taxes should be abolished." I have not read it thoroughly enough to comment (the weather has been too nice and my kids are still out of school), but as founder of the Pigou Club, I thought I should alert my blog readers to this new study on the principle of full disclosure. I do have one question for the authors: If Congress were considering repeal of the gasoline tax together with an income tax increase to make up the lost revenue, would you favor this revenue-neutral change in the tax mix? The answer to your question is that we would favor an elimination of federal highway and mass transit spending to correspond with an elimination of the federal gasoline tax. Highway and mass transit programs are more appropriately shouldered by state and local governments. Judge for yourself whether that answers the question. Here is a profile of my Harvard colleague Susan Athey, written by Joshua Gans (who, coincidentally, is a coauthor of the Austalian adaptation of my favorite economics textbook). The WHO judged a country's quality of health on life expectancy. But that's a lousy measure of a health-care system. Many things that cause premature death have nothing do with medical care. We have far more fatal transportation accidents than other countries. That's not a health-care problem. Similarly, our homicide rate is 10 times higher than in the U.K., eight times higher than in France, and five times greater than in Canada. When you adjust for these "fatal injury" rates, U.S. life expectancy is actually higher than in nearly every other industrialized nation. He [J.C. Bradbury, author of The Baseball Economist] proposes that the players' union should adopt its own testing policy. The union itself would fine players who use steroids and distribute the fines among the other players—very sensible, since steroid users are imposing costs on other members of the union. The FT has lunch with Ned Phelps. Did the Marshall Plan matter? Harvard historian Niall Ferguson offers his thoughts. 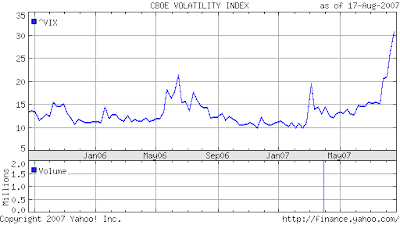 This is the VIX index, which uses options prices to measure expected stock market volatility over the next 30 days. The latest run-up is striking. It suggests that the recent bumpy ride in financial markets is likely to continue for a while. My son Nicholas (soon to be a 7th grader) and I have been reading together Mathematics: A Very Short Introduction by Timothy Gowers, winner of the Fields prize. The book is not a primer but a wonderful, basic introduction to the idea of mathematics as an exercise in abstract, rigorous reasoning. Gowers uses a series of intriguing yet simple examples to explain how mathematicians think about what they do. I love the questions he addresses: For example, how can one prove, from first principles, that 0 x 0 = 0, or that 2 to the power of 1/2 equals the square root of two? (If questions like these strike you as nonsensical, that just goes to show, Gowers might say, that you have not thought about the issues in a sufficiently fundamental way.) Or how can one prove that the square root of two is an irrational number? Here is a fun problem from the book: Consider an NxN square grid made up of 1x1 unit squares. Now take away from this grid two corner squares from diagonally opposite corners. The resulting board, which is now a square with two notches, has NxN-2 unit squares. You are then given dominoes with dimensions of 2x1. For what N can you completely cover the board with these dominoes? Think about the problem on your own. I will post the answer (or at least part of it) as the first comment. Here is a new ranking of economics blogs, based on Technorati data. From the NY Times, a sad update on the distinguished economist and policymaker Ned Gramlich. Wondering what to do with that economics degree? Here is a new kind of job opportunity. Like many central bankers, Eyjolfur Gudmundsson spends his days fretting about inflation, making sure monetary growth is reasonable and trying to collect data about the economy. The difference is that the economy Guodmundsson oversees exists only in the virtual world of Eve Online, a science fiction computer game run out of Iceland. Guodmundsson is the newly appointed chief economist for CCP Games. Here is the latest clip from the standup economist (who, you may recall, previously translated the ten principles of economics). If you enjoy these, check out also his bumper sticker routine. Update: Here is an article about Yoram. Phil Levy, the international economist I once had the pleasure to work with at the CEA, has a nice piece on the farce called U.S. China policy. Thanks to some federal prodding, it looks like congestion pricing may well come to San Francisco and New York City. I have not read the book, but I love the title. 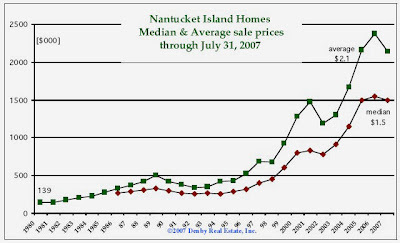 Nantucket residential real estate is selling at about three times the price it was a decade ago. According to one conversation I had with a realtor, the price of a summer house now is about 30 times the gross annual rental income that the house commands. A bubble, perhaps? For men, much of the gain in free time comes from a decrease in on-the-job hours. Their core market work has dropped [since 1965] from 42 to 36 hours weekly, the economists say....The average "core" time women spend on the job has climbed a bit, from 19 to 23 hours, but their total nonmarket work has plummeted -- from 33 to 23 hours....A depressing finding is what we do with our alleged extra time: mostly, watch TV. Hobbies are flat while reading and socializing are both down. Cornell's Robert Frank thinks most teachers of introductory economics are doing a lousy job. Would you recommend someone to do a PhD if he knows he's unlikely to become a star in the field (weak math background due to lack of trainings and not being particularly gifted; lack of confidence in his creativity and talents) and does not have a burning desire to do research, but has interests in social science, enjoys learning, and likes to be able to interact with people he admires and respects? Or do you think it's better for him to work first until he's certain that research is what he wants to do? A PhD takes quite a bit more time and concerted effort than most graduate degrees. An MBA is two years, a JD is three years, while a PhD is often about five or six years. This fact has a couple implications. First, you should be more confident that you really want the degree before you start (although there is nothing dishonorable about starting a PhD and then changing your mind after a year or two once you recognize that it is the wrong path for you). Second, you should not take off much time after college before starting. A year or two is fine, but more than that can be problematic, for the simple reason that as most people approach age 30, their willingness to lead a student lifestyle diminishes. If one has the requisite degree of enthusiasm and commitment, however, one needn't be a superstar to pursue a PhD. A person can be perfectly happy with a PhD from a lower ranked school, followed by a career as a college teacher. There are thousands of economics professors around the country (as well as PhD economists in government and the private sector), and most lead very satisfying lives without ever being candidates for the Nobel prize. The one thing they share is a passion for the study of economics. Special Topics in Calamity Physics. A bit too verbose for me, especially the first half of the novel, but fun nonetheless. Twelfth-graders did better on a recent national economics test than they did on similar math or reading tests, according to results released Wednesday. Students who took a high-level economics course, such as one labeled Advanced Placement or honors, were more likely to score high on the national test than students who did not take a similar course, according to the governing board. But high schoolers who took a general economics course did not do any better on the economics test than students who didn't take a class, which raises questions about the rigor of those basic-level courses. I have often worried about the quality of high school economic courses. Over the years, I have met quite a few AP teachers (and even spent some time as a member of the committee that writes the AP exam), and I am confident in the quality of those courses. But the non-AP courses, from reports I have heard, are less consistent in quality. Basic high school courses in economics need to start looking more like the introductory courses taught in college. Over the last several years, America’s imbalances in trade and other global transactions have worsened dramatically, requiring the United States to borrow billions of dollars a day from abroad just to balance its books. The only lasting way to fix the imbalances — and reduce that borrowing — is to increase America’s savings. But the administration has steadfastly rejected that responsible approach since it would require rolling back excessive tax cuts and engaging in government-led health care reform to rein in looming crushing costs — both, anathema to President Bush. It would also require revamping the nation’s tax incentives so that they create new savings by typical families, instead of new shelters for the existing wealth of affluent families — another nonstarter for this White House. In the absence of leadership from the White House, the presidential candidates could elevate the issue, outlining their own plans to boost savings. But until the administration — either this one or the next — is willing to acknowledge the source of the economy’s imbalances, and starts addressing them seriously, the dollar is likely to remain weak. I am all for taking steps to increase national saving, such as reforming the tax code to tax consumption rather than income and reducing the budget deficit through a combination of entitlement reform and additional revenues using Pigovian taxes. (Recall this op-ed of mine.) But the Times fails to acknowledge that increased U.S. saving will, according to standard macroeconomic theory, weaken the exchange value of the dollar. This is described fully in Chapter 32 of my favorite economics textbook. The intuition is that higher saving will reduce the interest rate that equilibrates the market for loanable funds. (Equivalently, one could say that it lowers the interest rate consistent with output and employment at their natural rates.) Lower U.S. interest rates will discourage the inflow of capital from abroad. The reduced flow of capital into the United States will reduce the demand for dollars, thereby decreasing value of the dollar in foreign exchange markets. If more saving means a weaker dollar, it seems odd to argue, as the Times seems to be, that a weak dollar reflects our failure to save enough. Update: Dean Baker and I are on the same page. On energy, Dems are daffy, Newt is nuts. Bridge fall may mean gas-tax hike. David Ignatuis on the retreat from free trade. The Boston Globe on Harvard political scientist Robert Putnam. Steven Pinker on dangerous ideas. Over the past four decades, Medicare’s and Medicaid’s costs per beneficiary have increased about 2.5 percentage points faster per year than has per capita gross domestic product (GDP). The big question is whether health costs will continue to rise as they have in the past. A good read from one of my Harvard colleagues. When asked whether they’d rather have a 4,000-square-foot house in a neighborhood of 6,000-square-foot McMansions, or a 3,000-square-foot home in a zone of 2,000-square-foot bungalows, most people opt to lord it over their neighbors. Do people really behave as reflected in this survey? I bet the 4,000 square foot house surrounded by McMansions would sell for more the 3,000 square foot house surrounded by bungalows. Market prices should reflect the externalities imposed by neighbors. I don't spend a lot of time talking with real estate agents (I have been living in the same house for about twenty years), but if my recollection is correct, their conventional wisdom is that houses surrounded by bigger, more expensive homes sell for more, other things equal, than houses surrounded by smaller dwellings. This suggests that the rich convey positive, not negative, externalities. Americans without employer-based insurance, or those who would rather have individual coverage, should enjoy the same tax benefits as the 175 million Americans with employer-based coverage. We can do this through a new tax-free income exclusion up to $15,000 for Americans without employer-based coverage. Any amount a family pays less than $15,000 -- for individuals, less than $7,500 -- could be put tax-free into a Health Savings Account. This would create a powerful incentive for more Americans to own their private health insurance -- making it portable instead of dependent on an employer. In case you forgot the Bush plan and the generally favorable reaction it got from serious commentators, click here, here and here. you'd have to go back to 1984 to find a Democratic nominee (Walter Mondale) who didn't attend one of those elite universities [Harvard or Yale] for either college or graduate school....And the pattern will continue in 2008 if either Hillary Clinton (Yale Law) or Barack Obama (Harvard Law) wins the nomination. In today's Washington Post, congressman John Dingell pushes for a carbon tax. He ends by suggesting, however, that cap-and-trade is politically more feasible. If the public understood this theorem, the carbon tax alternative, with revenues rebated to households through lower payroll or income taxes, would attract a lot more interest. I thought I would write to ask you the following question: If you could teach every American teacher three economic concepts, what would they be? 1. Comparative advantage and the gains from trade. 2. Supply, demand, and the efficiency of market equilibrium. 3. Market failure, such as externalities, and the role for government. The lesson is that we can all gain from economic interdependence and that markets are a good, but not always perfect, way to coordinate people in an interdependent world. This new book by Princeton economist Alan Krueger is sure to get a lot of attention. An ad announcing this is in today's Wall Street Journal. Will it work? Sadly, it did not last time.